Content of this tutorial is mainly based on the chapter Chaouiya 2012, updated for GINsim-2.9 and complemented with recent advanced functionalities. Here, we rely on the logical model presented in Thieffry 1995, which focuses on the core of the lambda regulatory network involving four main cross-regulating genes: cI coding for lambda repressor, the only gene in the lysogenic state; cro, coding for another repressor, expressed in the lytic cycle; cII, an activator of several lysogenic genes, including cI; and N, an anti-terminator factor promoting cII expression. 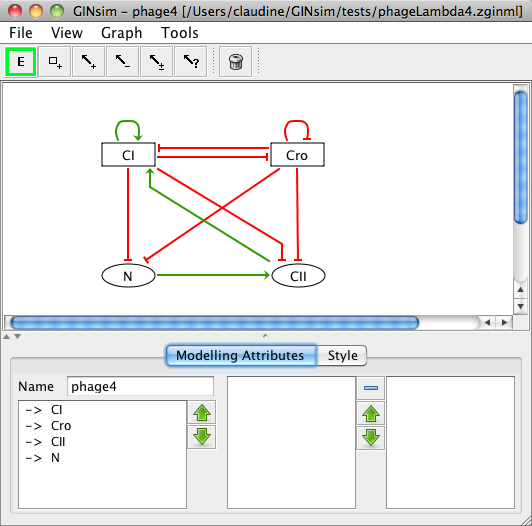 A more complete description of the model is available, along with the GINsim model file, in the model repository. Core regulatory network displayed in the GINsim main window.